Black, Red, Love, and Hope on the Reservation. The invitation to travel to Pine Ridge with the Center for Mind-Body Medicine could not have been more ill-timed to arrive at the doorstep of my life. I had just returned from a week in Portland, had a pile of unread e-mails in my box, a basement that appeared to have vomited clothing,a mound of bills, and the looming cloud of an incomplete 1040. Instead of writing a list of logical reasons why I should not leave town on such short notice, I asked the one person in my life, who’s wisdom and heart were the only important matters to consider — my 16-year-old daughter. She pondered my dilemma, then mindfully asked, “Are you inviting yourself, so you can be like all the other ‘helpers’, or were you invited by the people?” I replied, “I was invited”. She turned her matching eyes to mine, and responded, “Then you should go”. I e-mailed my affirmative response, and began to pack my bags. The night before my departure, I wrote, “Ya Allah! Where are you sending me now? What am I supposed to do at such a holy place? Do I even qualify for the work in this land?” I was afraid of what I would see there, and was equally fearful of closing my eyes and missing the lesson. The golden lands of our drive to the rez, momentarily transposed me to my husband’s ancestral village, where, from my American lens, we turned left a goat, and landed in the arms of a people who I had waited a lifetime to embrace. That same sense of a long-awaited journey returned when our community of mind-body medicine healers gathered for the first of several evening meetings. One of my beloved Native sisters opened the meeting with a reminder that God created us to make mistakes. That quote was one of the most oft-repeated messages of my Sufi teacher. While it had never occurred to me that that I would experience the light of the Prophet Muhammad in the middle of South Dakota, I was certainly not surprised to feel it tickle my heart, and gently rub my chin. I breathed in the scent of burning sage, listening to the soft whisper of the ancestors welcoming me home. Our days of teaching began in a school auditorium, with the prayers and blessings of the elders. While I had no direct translation for the words, my heart downloaded a complete transmission. The prayer songs of the children whispered to my soul, each syllable resonating in every cell. A young man transcended his trauma through one of my love languages, and we connected through our common, “mother tongue”, hip-hop. His poem transformed me to my other first home, hip-hop’s birthplace, the South Bronx, where our music mirrored the joy and pain of being all shades of black and brown. As he shared his song, he was no longer a native boy telling his story-he was my nephew, cousin, first lover, son of my sisters, partners of my children. He was my son…and I, his protective mother. I felt no separation between us, as my arms instinctively raised to immediately shield his heart from all future injury. I wanted to stop the bleeding, mend the scars. Yet, I knew that I was not there to fix him — I was there to teach him to learn to heal himself. We were often late, sometimes, as long as two hours. Like Africa, there was nothing to be done to change the honoring of this process. We could neither halt our feelings, nor hasten the experience. My small group was unlike any I had ever served. We ranged in age from 11 to 63. The two native teens who spoke of hip-hop as their savior…the uncertain pre-adolescent, who, with limited sound, revealed the sweetness of his soul…the three mothers who had suffered unspeakable losses, all impacted by violence, sexual assault, and addiction, yet stood in active defiance against the statistics that dismissed them…the middle-aged half-Native man, struggling to surrender to love…the white male teenager, faced with the dual realities of oppression in his new family, and privilege in his real life… and me — the African-American Muslim, chosen to lead and be led, to healing within the confines of this small, yet sacred space. Each small group session brought us closer, as we slowly lifted the veils of shame, separation, fear, disease, loneliness, and despair, that had impacted our individual and community health. 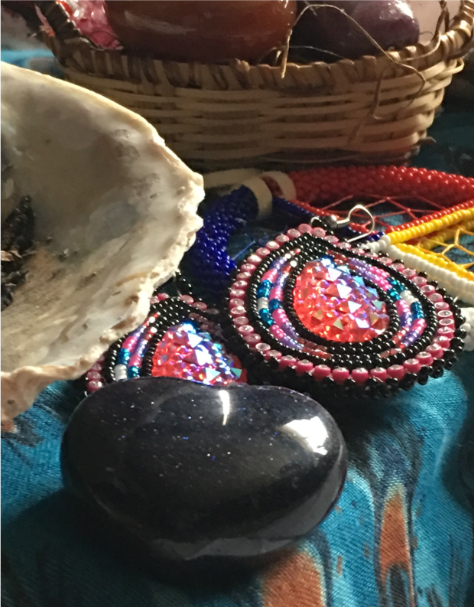 We burned their power out of our space with every smudging, teaching, and honored story. I was immediately transported to the elevated subway in the Bronx. The same white men were below the “El”, with strings in each hand. The rake was more like a puppet prop. While still attempting to manipulate it, one of the men angrily stated that he would rather be fishing. In the dream’s next segment, I ran into an old friend, who I knew was involved in organized crime. We embraced, and I was comforted by his physical strength. Suddenly, he was whisked away by a prison guard. The guard informed me that my friend had been sent to prison for a “pay-out”. When I asked for a definition, he handed me beauty supplies and samples. Over the next few days, I witnessed the unfolding of my dream sequence, and its message from beyond. Each morning, I grew closer to the morning prayer song…the elder women called me, “young sister”, the children giggled in my presence. My beloved Native friend played his flute to the sound of my mentor’s guided imagery on forgiveness, and we held those who had harmed us with loving kindness. We re-committed to the care of our bodies, which had been loaned to us for sacred purposes. And we honored our ancestors with love, hope, and the deepest of connections. They arrived each day with gifts for our expanding altar, and I left with a little less material wealth than I had arrived with. I stood at the Wounded Knee cemetery, and sprinkled a gift of tobacco to the souls that were buried at that sacred site, one of the many seats of our country’s shameful past. I ate lunch with the Medicine Man, who reminded me that the true leader neither boldly stands in front nor fearfully follow behinds his/her people. Instead, the leader stands in the center, strengthening the community through service and support. Sitting with his beloved wife of almost 40 years, he looked at me, and said, “they tried everything to get rid of us…and we’re still here.”. I nodded, while Mama Maya Angelou softly invited her song to my lips, “You may write me down in history, with your bitter twisted lies. You may write me in the very dust, but still, like air, I rise… Maya, who taught me to dance like I had “diamonds at the meeting of my thighs”, sent me my final message — healing happens with every shake, and the honoring of every story. My small group concluded with gifts, tears, and hope. In the larger group, 130 of us embraced in a handshake ritual that united nations, practices, spirits, and all of humanity. My sheikh taught us to bow before the souls of each person who comes to us for healing. I will forever be bowed to this community, and their courageous hearts. I was invited to the Reservation to give a healing — in the process, I received one of my own. Dr. Sabrina N’Diaye is an integrative psychotherapist and founder of the Heart Nest Center for Peace and Healing in Baltimore, Maryland. There, she lovingly serves women, couples, other healers, and small groups. Her approach to healing is a blend of wisdom, science, and ancient spiritual practices. She is also a proud faculty member of the Center for Mind-Body Medicine, where she teaches the art of self-care to healthcare professionals around the globe. She is currently serving the Center as a teacher and guide for Jordanian healthcare professionals who are in service to Syrian refugees. Dr. Sabrina is a highly-sought public speaker, member of the treatment community, and frequently lectures on spirituality, self-care, and the “magic” of connection. Her many audiences include police departments, flight attendants, healing artists, peacebuilders, and aspiring writers. She is currently writing her first book, The Laugh of Love, based on her maternal grandmother’s ability to transcend multiple traumas and chronic illness. Dr. Sabrina is a devoted wife, mother, daughter, and life-long learner, who remains humbled by the healing power of compassion, love and forgiveness.